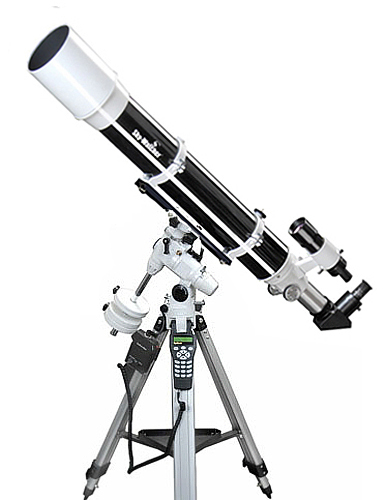 The EQ3 PRO SynScan™ mount is a perfect instrument for novice visual observers and imagers to enjoy astronomy with minimal setup time and in-depth knowledge of the night sky. * Positioning Accuracy up to 1 arc minute. Accuracy enhanced by software collimation error (mount mechanical error) compensation. * Stepper motors with 1.8° step angle and 64 micro steps driven. * Slewing speed up to 3.4°/sec (800X). * Guiding speed selectable from 0.25X, 0.50X, 0.75X, or 1X. * 42,900+ Object database containing complete Messier, NGC, and IC catalogues. * Upgradeable hand control via internet download. 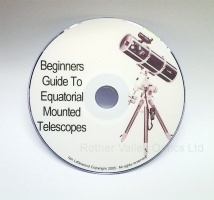 This is a fantastic, straightforward instructional DVD on how to set up and use equatorial mounted telescopes. Learn how to use your equatorual mount in just 45 minutes! 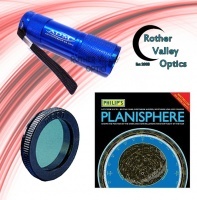 Rother Valley Optics have put together a beginners package which is suitable for any telescope. The kit comes with a planisphere, Skywatcher ND Moon Filter and an ADM Red Torch. All these items are perfect to go alongside any telescope to get you up and running.